As we each reflect on our own personal brand and how we want to show up, our legacy, and our relevance, it is helpful to hear from others. 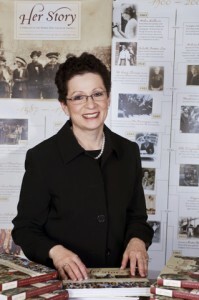 In this interview, I am thrilled to interview Jill Tietjen, author ofHer Story: A Timeline of the Women Who Changed America, STEM champion, and the President of the National Women’s Hall of Fame. Reflections of an authentic, purpose driven personal brand. Below are a series of questions and wonderful insight from Jill. 1. Who are you? What would you want people to know about you? 5 words that describe you? I am a problem solver â€“ probably one of the reasons that I became an engineer (I just thought it was because I was good at math!). I have a very high energy level, think very quickly, and am able to accomplish many things. But, what that means to me is that much is expected of me â€“ I must use the talents and abilities that I have in order to make the world a better place. I believe I have the characteristics that I have identified as keys to personal and leadership success for the women in Her Story â€“ passion, determination, and persistence. People say that I am intense. I have even been told that on a scale of 1 to 10 for outcome orientation, I am a 15 (meaning ensuring that I get things done and that they are done the way that they are supposed to be done). I believe the Nike slogan: Just do it! I would use these five words: Energetic. Passionate. Determined. Persistent. Courageous. (When my strengths were identified, they were analyzer, achiever, activator, strategic, learner). 2. What have you learned from people? I have learned and continue to learn so much from those around me. Listening is an incredibly important skill to develop and forms the basis for pretty much everything else. I am learning patience (not always well). I am learning about worlds and areas of knowledge to which I was not exposed during my formal education. I believe that every person has value and deserves to be respected and well treated. I believe that women need to learn to work together for the common good. I believe that women are undervalued in our society â€“ to our countryâ€™s detriment. I believe that valuing womenâ€™s accomplishments and treating women as true equals would significantly improve our culture and economy, and the worldâ€™s culture and economy. 4. How does your brand align with Her Story and why is that important? As a woman engineer, I have been the only or one of the few for most of my working life. Thus, I understand the groundbreaking efforts of the women profiled in Her Story. I also agree and try to live by Madeleine Albrightâ€™s statement â€œThere is a special place in hell for women who donâ€™t help other women.â€ I tell the stories of great women. My vision is to inspire and motivate an army who will change the perception of women around the world. Women need to be valued for our culture and world to thrive. I intend to be part of that change. 5. What are the three most memorable experiences you have had? This led to a series of experiences that I am grouping together. In 1991, due to my efforts to prepare her nomination, Admiral Hopper became the first individual woman to receive the National Medal of Technology (the U.S. equivalent of the Nobel Prize, awarded by the President of the United States). Admiral Hopper was too frail to attend the ceremony and she asked me to receive. There I was, on the hottest day of my whole life, in the Rose Garden, accepting her Medal from the first President Bush. Admiral Hopper was my first successful nomination to the National Womenâ€™s Hall of Fame â€“ the family asked me to accept (Admiral Hopper was deceased by then) and I made my first trip to Seneca Falls (1994) â€“ which I characterize as life-changing. On the coldest day of my whole life (1996), I was at the Bath Iron Works in Bath, Maine for the launching of the Destroyer Hopper. It is truly awe-inspiring to see a ship launched â€“ and for it to be named for Admiral Hopper â€“ and to know that I maybe had some influence through my nominations, wonderful. (P.S. I was at the White House again, 20 years later to witness, my nominee Yvonne Brill, receive what is now called the National Medal of Technology and Innovation from President Obama, in the East Room). I was invited to speak in Florida in Cocoa Beach at night. Flying in from Denver meant I was in town and not committed for the morning and afternoon. My hosts arranged for me to have a personal tour of Cape Canaveral. This included being dressed in a bunny suit for a tour of the Shuttle Discovery which was undergoing preparation for its next mission. I was in the crew quarters and on the flight deck in the pilotâ€™s seat. I truly relished that once-in-a-lifetime opportunity. In March 2010, I was inducted into the Colorado Womenâ€™s Hall of Fame. After nominating so many women for various national, state, and professional society awards, I was stunned that I was receiving that honor. I believe that I must carry the mantle and ensure that I continue to undertake efforts worthy of being an inductee. 6. What is the biggest challenge in your mind for women? And men? The biggest challenge for women is being accepted as equals. We have thousands of years of thinking and behavior to the converse to overcome. Only when women are accepted as equals â€“ paid equally, respected equally, reported equally, treated equally â€“ will our society be able to realize its full potential. Thank you Jill so much for interviewing with us! Remember to be your best self.